0 Comment July 25, 2017 Like? In this blog post, I want to show you how to add really great video production to all your videos, whether you make recordings or go live on social media networks such as YouTube and Facebook. The number one tip, I can give any video maker, is not to worry about 4K versus 1080p or 720p streaming. Most live video productions professionals will agree the best thing you can do for your live stream is add additional camera shots. For example, if you are live streaming a music concert add a back backstage camera that can show some really cool views for your pre-show. By adding more cameras and more views for your audience, you will be immersing your audience further than expensive 4K gear and cabling. 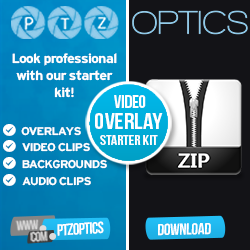 For this video, we have added two, PTZOptics ZCam-VL model cameras. These models provide really great close-ups with a wide 122-degree field of view. PTZOptics offers 2 ZCam Models, a 20X and a VL which stands for Variable Lens. These cameras include HD-SDI video outputs with 1080p60fps resolution and they also have network streaming with power over ethernet. So you can power these cameras with a regular PoE Switch. You can manually adjust 4x optical zoom and focus with the variable lens ZCam or use an CL lens available on the market to extend your camera functionality. It’s always a good idea to wall mount your ZCam camera to keep them out of the way in your live streaming area. We show an installation video, where the ZCam is attached via a threaded quarter twenty tripod connection. They are super easy to install all throughout your building. The ZCam has an especially crisp and sharp view of close up macro object views. As you can see, the camera allows you just get those behind the scene shots those over-the-shoulder shots the different shots that can really add great production value to your system. You may have seen the video above that allow you to automate camera switching playlist a vMix playlist. You have we have multiple cameras, in this case here we have 3 PTZ cameras and we have two ZCams. Once you have all of your video inputs set up into a playlist you can have them automatically transition as you’re running your live show. You can also a trigger them to be used based on audio. So you can set up different microphone inputs to control PTZ camera positions and another video switching. As you can see, we have 4 HD-SDI inputs coming into a Magewell HD-SDI capture card. Since we have more than 4 cameras we devices to use a Geffen 4×1 HD-SDI switch to add additional cameras. The HD-SDI Switcher actually includes a little remote control here so I can actually just go ahead and live switch the cameras wirelessly. That’s a great way to add extra cameras with a single HD-SDI 4 port capture card in your system. Learn more about our 20X Optical Zoom Box Camera w/ 3G SDI here. Learn more about our wide angle 3G SDI box cameras for live streaming here. Engage your audience with multiple camera angles… See how we added some wide angle box cameras to our live streaming setup here. See the 20X-SDI Box camera product page here. See our Wide Angle Box camera product page here.